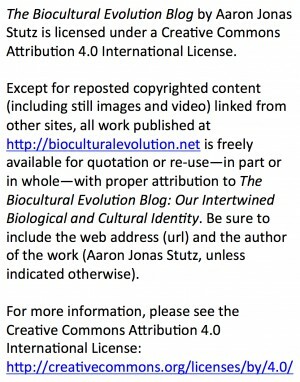 Welcome to the Biocultural Evolution Blog. I decided to launch this blog because “biocultural connections” and “biocultural evolution” get to the heart of what many anthropologists and human biologists want to investigate and understand, but as foundational as these phrases seem to be for anthropological theory and human evolution research, it’s clear that they mean different things to different people. Basically, they are really useful phrases for scientific inquiry into human diversity and our place in nature, but one anthropologist’s biocultural perspective may cause another to just look away. A blog seems like a good way to explore and synthesize the best of the biocultural perspectives that are out there. And this attempt–although it mainly comes from my stubborn tendency to try to find consensus and points of agreement among colleagues and mentors who see things really differently–may be timely. It may be more important than ever for Anthropology, as an academic discipline, to buckle down and get to work. We need to share our better selves as teachers and researchers with our students and readers, to encourage them to follow our lead–in developing, or continuing to develop, substantial critical thinking and communication abilities … learning about new aspects of the world, new ways of seeing, explaining, and then critiquing our own understanding … and in doing so, making connections between our new knowledge and the familiar, so that our learning and engagement with each other and with the world becomes more relevant to each of us, but more profound and insightful to all of us. Don’t let the speech-writer style I just got carried away with distract you. Think about the substance. Although I’m coming relatively late to the anthropological blogging game, having been inspired by highly talented and dedicated colleagues, I would suggest that there’s still a need for discussion of biocultural connections that really goes deeply into both the biological and cultural sides, in order to find new connections. If you feel that the introductory Overview posts are still too much on the biology side, just wait. And remember that one interesting–but defiantly challenging–thing about anthropological inquiry is that it does aim to explain how we can be biological organisms in biological populations, yet have such rich symbolically structured imagination, understanding, and expression. And this brings me back to why blogging about biocultural evolutionary perspectives and issues makes sense. As John Hawks, Holly Dunsworth, and Adam Van Arsdale have already shown, it is also important to remind students, readers, as well as colleagues that good teaching and good research are powerfully synergistic together; they make learning MUCH more effective for everyone involved. So I’ll also be sharing about the topic of teaching and learning, especially in higher education and beyond. How did Paleolithic Hunter-Gatherers Use and Consume Plant Resources?